The Sexuality and Gender Acceptance (SAGA) student organization hosted a “Lead-Up Week for Trans Day of Visibility” the week of March 25. SAGA, described as a community and resource for LGBTQIA+ students at Occidental on the organization‘s Instagram, hosted daily events to foster support for the trans members of the LGBTQIA+ community on campus, leading up to Trans Day of Visibility March 31. Zach Schuman (sophomore), SAGA secretary and historian, said that SAGA agreed Trans Day of Visibility called for more than just one event, leading to the cultivation of the Lead-Up Week’s events. Lead-Up Week began with the “Trans Student Mixer” March 25, which Schuman described as an opportunity to foster relations within the trans community on campus. SAGA continued Lead-Up Week by tabling on the quad March 26 to provide trans literature and resources, and hosting a clothing swap March 27–28. 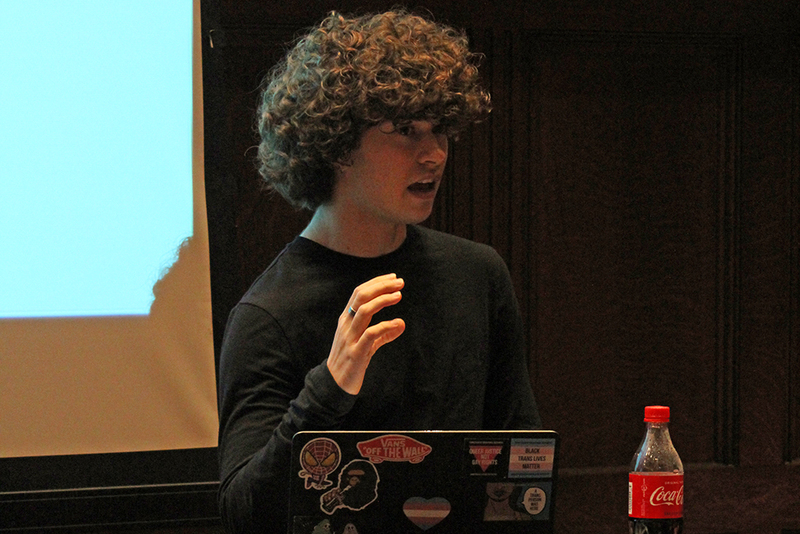 Schuman spoke about the difficulties that queer, trans and gender-nonconforming students experience when trying to participate in general clothing swaps either on or off campus. “Even just going to a clothing swap and looking at clothes that you’re interested in, when that’s not normative, can be really hard for people,” Schuman said. With both the trans student mixer and the clothing swap events, Schuman described SAGA’s intention to tailor the events to suit trans students’ needs by providing a space deliberately created to support them. He discussed how trans students’ experiences at what can be seen as “regular” events are often entirely different from students who are not members of the trans community. “Meeting other people and having a clothing swap are things that everyone does, but we wanted to make it specifically for trans students because of how different our experiences are from other people when it comes to things like, for example, buying clothes and swapping clothes,” Schuman said. The Lead-Up Week concluded with a film screening of “A Fantastic Woman” March 29, followed by a discussion led by Jack Tripp (sophomore), SAGA trans student liaison. Tripp is a Media, Arts & Culture (MAC) major and Critical Theory & Social Justice (CTSJ) minor and holds a strong interest in studying trans representation in the media. Speaking about the need to increase trans representation on Occidental’s campus, Tripp supported inviting trans speakers to campus and increasing the number of trans professors in the faculty in order to better educate students on the trans community. Tripp said the main focus of Lead-Up Week was increasing the visibility of Occidental’s trans community. SAGA aimed to better inform the campus community about the needs of trans students and to provide trans students with resources. Jenna Beales (first year) described her enthusiasm for Lead-Up Week, praising SAGA’s strong presence on campus. Beales spoke about the lack of resources for Occidental’s LGBTQIA+ community, which became apparent to her when she was touring Occidental and when she first arrived on campus. She believes that SAGA’s continued presence on campus is vital to Occidental’s general community. Both Beales and Schuman touched on the importance of active participation in organizations such as SAGA from members of the student body. Schuman said the most important thing to do to support the LGBTQIA+ community is to show up. According to Beales, if you are not a member of the LGBTQIA+ community, it is important to be aware of the space that you are taking up as an ally.